Primitive neuroectodermal tumors (PNETs) are embryonal tumors composed of undifferentiated or poorly differentiated neuroepithelial cells. These tumors were first described in 1973 by Hart and Earle, who described PNETs as tumors that were morphologically similar to medulloblastomas, but occurred outside the cerebellum. In 1993, the World Health Organization (WHO) recommended classifying medulloblastomas and PNETs under a single category, namely PNET. Those PNETs occurring in the cerebrum or suprasellar region are referred to as supratentorial PNETs (sPNETs). Pineal PNETs, otherwise known as pineoblastomas, are not considered by WHO to be sPNETs and have been excluded from discussion in this chapter. Within the group of sPNETs, tumors with a clear neuronal component have been subclassified as cerebral neuro-blastoma and those containing ganglion cells as ganglioneuroblastoma. 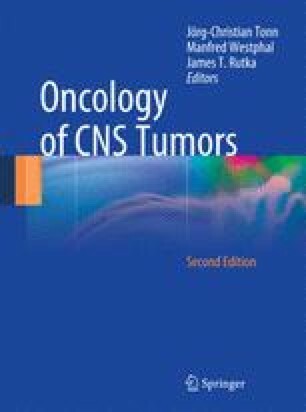 All PNETs are considered WHO tumor grade IV. Despite the histopathological similarities between sPNET and infratentorial PNET (medulloblastoma), they exhibit different molecular genetics and important differences in terms of response to therapy and outcome. As such, sPNET must be considered as distinct from medulloblastoma (Table 37.1).